I’ll do anything to get Elspeth to eat a vegetable. Including cooking one into a chocolate cake! It works; she loves it! A word of warning though: in true gluten free style, it is rather crumbly. Worth the mess, though, it’s delicious. Pre-heat oven to 180 degrees Celsius. Grease a cake tin. Mix flour, cocoa, and sugar together in a large bowl. Melt butter and chocolate together – either in the microwave, or in a bowl suspended over a saucepan of hot water. Add beetroot and eggs to the butter and chocolate, and mix well. Then add that all to the dry ingredients, and mix well. Pour into cake tin and cook for 50 minutes. Leave in tin to cool for 10 minutes. 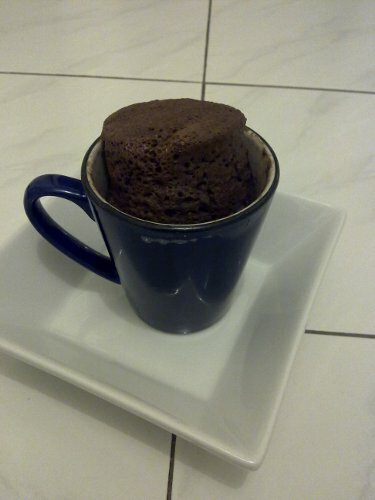 This quick and yummy cake is made in a mug – yes, you read that right, a mug! Make sure your mug has a capacity of at least 300ml, and is microwave safe. Put dry ingredients (flour, sugar, cocoa) into the mug and mix well. Ensure there are no lumps. Add the egg, and whisk thoroughly. Make sure you mix in all the dry ingredients. Add milk, oil, and vanilla essence, and mix well again. Put mug in the microwave, cook on high for three minutes. Leave to stand for one minute before either eating straight from the mug, or turning out onto a plate. NB: My microwave is quite a new, high-powered one (1200 watt, I think), and if I do it again I’ll either reduce the time or the power slightly. I think 70% power should be adequate. Mix potato and sugar by hand. Add flour and cinnamon, then slowly stir in the milk. When all ingredients are well combined, add sultanas and stir them through. Bake in a cake tin at 180 degrees C for 50-60 minutes. Mix all ingredients except coconut, spread on top of bun, then sprinkle on the coconut. 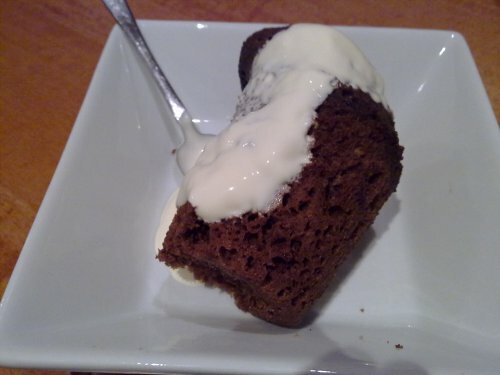 I found that the icing didn’t really come together, so I added a little more margarine and a splash of milk – maybe a little too much, mine’s a tad runny, but still works ok! How can one brand be so variable? 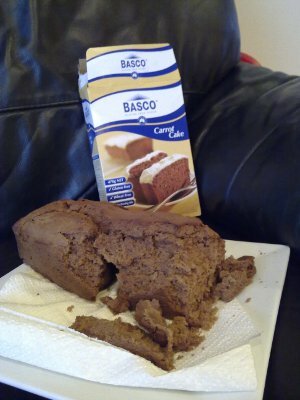 I’ve made Basco’s chocolate cake a couple of times, and it’s wonderful. 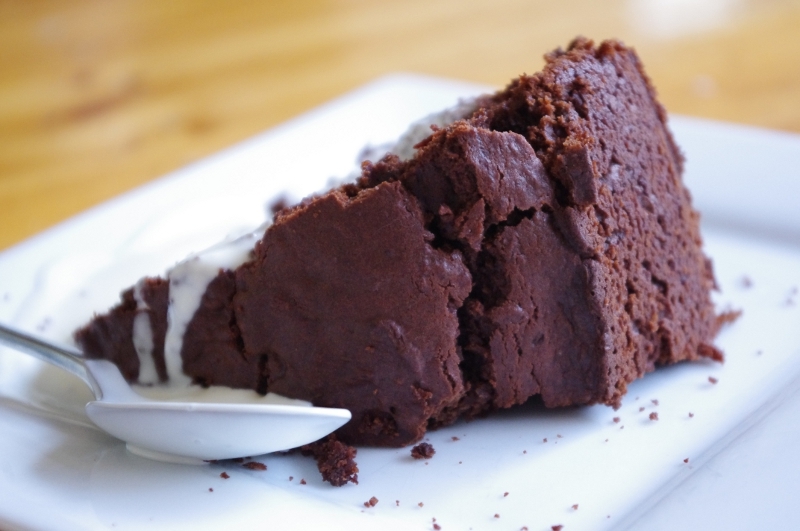 It is moist and tasty and you can barely tell that it is gluten free. Lovely stuff! In fact I’ll probably do that one again for Elspeth’s birthday party. But I just tried their carrot cake. Oh, what a contrast! It is crumbly and doesn’t taste very nice – it certainly doesn’t taste anything like carrot! I’m not even sure I’ll eat all of this, let alone make it again! 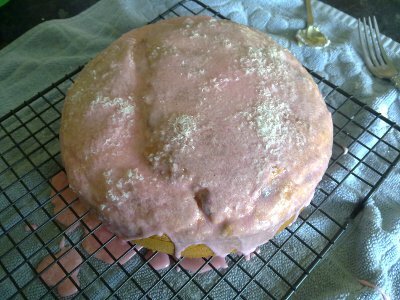 Next time I make a carrot cake, I will do it properly – from scratch!